Are you ready to supercharge your sourcing to the next level? 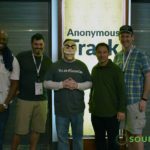 The Anonymous Track is going to be full of tips, tricks, and tools to really improve your sourcing game – it’s one of my favorite parts of SourceCon! All Anonymous Track sessions are designed for experienced sourcing and recruiting leaders, and it’s a fantastic feeling to jump right into deep discussions of some of the hardest challenges in sourcing. Here are the five absolutely jam-packed sessions.